Just imagine Connaught Place, New Delhi in 1926. After the great Durbar of King GeorgeV, The Capital of Of India had moved to New Delhi, In the 1920's the work on New Delhi with Edward Lutyens had begun. 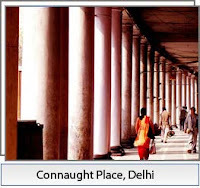 Connaught Place was to develop as the High Street under the guidance of Robert Tor Russel an engineer with CPWD. A block, with Nath and Co as Tailors and Drapers, Devi Chand and Co with a Uniform and Apparrel store, a Novelty Chemists round the corner and a Swiss couple (Jeanne Wengerer and her husband), own and run a wonderful restaurant called Wengers. Wengers is a throwback to more genteel times at CP, of buggy rides and live bands, afternoon teas and evening promenades around the fountain. But, unlike them Wengers has perfected the art of deceptive ageing. The upper floor once a ballroom and three tea rooms, might have been sold to bank. Creamy tarts with Kiwifruit and morel lo cherries might have nudged out staple strawberry, vanilla, pineapple and chocolate pastries, but old timers would insist Wenger's has not changed at all. The sto ry begins with Jeanne Wenger and her husband (called the Wengers) set up various outlets a wine store, a restaurant/ canteen in the Delhi University, a sweet shop in Daryaganj and the catering cafe at WHO (World Health Organisation). The legend has it the husband (I do not have the name as yet) died in a air crash in Europe. The lady Jeanne Wenger handed over or sold the business to Brij Mohan Tandon the Manager in 1945. The Tandon family with his three sons Ranbir Singh Tandon, Om Prakash Tandon and Anoop Tandon took the business forward. Today the third generation, Atul Tandon (son of OP Tandon) and Aman Tandon (son of Anoop Tandon) run the business with of course the survivor OP Tandon. Charanjit Singh the current manager (who joined in1965), reminisces, he was an AC engineer fromLucknow, the ma nagement saw his interest in catering and experimented, by giving him the job of contributing with running the restaurant. The restaurant was on the first floor (where American Express Bank has its office). He talks of times when a small set was priced at Rs 1.25 and had a set of tea a bread pakora and a pastry. The large set with four snacks, Sandwich, Mixed Vegetable Pakoras, Chaat and pastry and of course tea for Rs4.00. The menu was a lot different then.The restaurant shut down in 1979. The pastries as were in only four flavors and margarine was used which made them light er and fluffy, they had not heard of butter and fresh cream. These were buuzzwords which were to be used later.The other signature dishes that evolved, were Shammi Kabab (still a signature dish), Cheese balls (which no one has been able to replicate, including Wengers themselves, although all old timer CP restaurants attempt it, Embassy restaurant suceeeds somewhat) and Vegetable Cutlet. 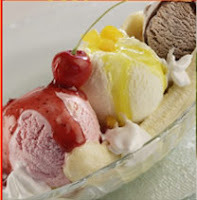 My earliest memories of Wengers are when we moved to Delhi (in 1979), my father IK Malhotra would talk about his salad days as a salesman of the early 1960's (an inspiration of this edeavor of finding and writing about places to eat local exotica for under Rs 100/- for of course the salesman). He would say, the day would begin with parking the sparkling Lambretta scooter at Wengers restaurant, have a cup of tea with a scrumptous patty with green chillies in vinegar and then kick start the day.Wengers for us was important, to picking up a patty and Keventers milk when me and dear wife Praveen were visiting CP and were on a budget or picking up dropping someone at the Railway station. Or packing food for the journey. This is in the early 1990's. Ofcourse Mom, the eternal foodie would treat herself and us to Wengers while she continued to call Janpath,Queensway, well into the 80's. 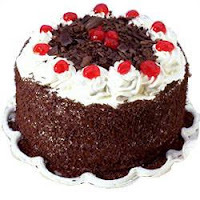 Then in 1996 or was it 1997, dear wife Praveen sent a treat for everyone in office at Discovery Channel at Gopal Das Bhawan, it was my birthday (she was a neighbor at Star Tv at Amba Deep Building). An then Wengers was on the menu for life, the plain cake, the shammi kabab, the paneer roll. And, of course the Christamas shopping with mince pies, christmas pudding and plum cake. On Easter, the ginger bread man, the signature hen and of course Easter eggs. Every time anyone goes to CP it's time for Wengers. Quick lunch at office Wengers. A birthday celebration, launch of Mint (the newspaper), wine and shammi kababs from Wengers. Who do you call......., Wengers !! And now Detective (our Daughter) and the third generation just loves the food from Wengers, The chicken patty, the Mushroom patty...... mmm light crust, just right sized with the right texture. Pretty much like Nirulas. What make these outlets continue Wengers 83 years and Nirulas 75 years, much before we were a modern nation. I am so surprised so little is written on Wengers which continues to thrive and grow on us and the generations ahead all out of one outlet and a humble bakery with a legendary status. Whats your favorite Wengers Story ? Parting shot, whats the price of Shammi Kabab, Paneer roll, Chicken patty and Mushroom Patty. No chronicler of Indian F&B can neglect the two legends and part of every Delhi wallahs life, One single outlet bakery and one time restaurant, Wengers. The other a restaurant in Delhi’s Connaught Place, now a 65 outlet restaurant chain, Nirulas. I have earlier attempted to crack the mystery and aura around Moti Mahal, Kwality and Gaylord. Now I attempt to the same with these titans since they are older in India than all those mentioned. Wengers the oldest big dady was born in 1926 (83 years old) and Nirulas was born in 1934 (75 years old). These geriatrics or senior citizens have been around for a really long time. What made these men from Lahore LC Nirula and M Nirula settle for a restaurant, after trying their hands in running a photo shop, optician shop and a pharmacy before 1934. In 1934 they opened theirb first, called Hotel India with 12 rooms, a restaurant and a bar license. Then conversion to the Nirula name and stuck to that. . It also show cased the first Chinese restaurant with the Chinese room ,in the 1950’s and of course an espresso coffee bar (though espresso then was actually a cappuccino). The 1960s witnessed the opening of two specialty restaurants Austro- Hungarian cuisine restaurant called La Boehme a toast of the glitterati in New Delhi and an Indian restaurant called Gufa. It hosted the Lala Charat Ram wedding, Raj Kapoor , judged a beauty show and it introduced Delhi to cabaret shows . In the 50’s my dapper uncle Ranjit Kumar on his father’s (my grandfather’s) borrowed motorcycle, a Norton or an Indian Chief parked it at Nirula’s and met at what they called Adda (meeting place, hangout joint) and we call Nirula’s this was at the famous L Block which also housed the Nirulas Hotel.He moved To UK in 1956 and often drinking Irish whisky with him he reminisces of the good times at Nirulas. The oth er turning point was the moving into the fast food business in the 70s when the sons Lalit and Deepak Nirula fortified with their Cornell University education started rolling out the , The Pastry Shop, Snack Bar, Hot Shoppe and the the Ice Cream Parlour (called Nirulas 21, it had 21 flavors, a first time in India) The Pegasus bar and Potpourri, a sit down restaurant with a salad bar were opened around this time. The world had changed ,Delhi was introduced to burgers , the big boy, the chilli burger and the mama of all the Mahaburger(as they were meant to be, not fried buns with a tomato, onion and a patty, although as a child I did not mind that as well) pizzas with sausages, the hot chocolate fudge ( which now has a facebook community around this sundae), hamburger steak, footlongs, banana split (yumm, a split banana with three scoops of ice cream, strawberry, pineapple and chocolate with their own toppings) and introduced us to really nice Hot Dogs. We were all living the Archies and Riverdale dream, we chose our own characters and thought we were at Pop Tate’s I was definitely Jughead and dreaming to be Archie once in awhile. The Nirula’s family got it right, in the 70s and 80s money was tight and aspirations were high. They got everything right. The Mustard had the right twang and the chillies in vinegar were divine (though the have stopped serving the chillies, the taste in my memory banks lingers on). 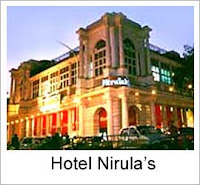 Today after the takeover by Narvis Capital of Malaysia and Samir Kuckreja (an old hand at Nirulas) it has over 65 outlets with more formats, as those at petrol pumps, at airports, a sort of express version, just ice cream parlours and pastry shops in addition to the restaurants and family style restaurants. Everybody said Nirulas has it right, three generations can dine on a table and enjoy the experience, the range was immense , Thalis, Fish and chips, Butter chicken, Dal Makni, Chilly Burgers, Sausage Capsicum Onion Mushroom pizzas, Shakes, Lime Ice, Pineapple Sundaes, Hot Chocolate Fudge, Pasteries, Shammi Kabab, it was more than a 110 long list all the stuff was good even some outlets had dosas. So what happened to the magic. It did evaporate a little with new girls in town, Mc Donalds, Pizza Hut, KFC and many many m ore. The Nirulas kept a brave fight with competing and sometimes saying we mean everything for everyone in the family. The new management is perhaps once again showind greater vigour. 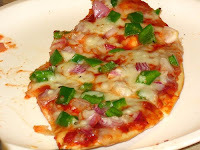 My own experiences start with an afternoon at the swimming pool and in the summer of 1980, landed at Nirulas at CP, It was at Hot Shoppe I had, the hamburger steak at under five rupees. My friends Ravi and Ashutosh would say, if Sam (that’s me) is broke, he will have a chilly burger (at Rs 7/) otherwise a pizza and a banana split (both at Rs 13.50 each). I had most of my dates there, initially lovelorn, I was gawky and choking on my food and gave all the attention to the foxy lady by gazing into her eyes, while she gave her attention to everyone and everything, Aas I gained confidence, I would focus more on the food than her. I knew I was developing a new relationship that with food and less with her. Cut to the present my dear wife Praveen goes with me as I am hanging on to the past (though she does enjoy some of the stuff when we order at home) and our little one Detective An, can’t let go of the mug of Hot chocolate fudge, she does not care much for anything else. More power to Nirulas and we don’t care if a Malaysian owns it or a Chinaman as long as they stay as close as possible to their genetic code. I am going to ask you to turnover to the next post for the Wengers story as it will make this post too long and unreadable. Whats your favorite Nirulas Story ? What’s your favorite at the Nirulas. 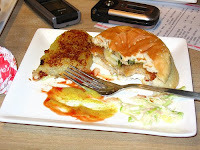 I know it’s a salesman’s guide to eating out, so why am I doing a review of an F&B outlet of a 5 star Hotel at New Delhi. Besides I never do reviews. The reason attributed for this unique departure. Pastry shops are the last bastion of the salesman’s visitation to a 5 star hotel. That too sheepishly slipping in after business hours for the 50% discount. A few decades ago it was the fine dining restaurants where shark skinned suit (a suiting material) and gabardine clad salesmen were often seen. Then we plebs started going to “the coffee shop”. Now we have been relegated to the pastry shop that too at a 50% discount. Before you get the impression I am doing a Bridget Jones on you (poor poor me). On the contrary, a salesman is all about opportunity, liberty, hope, dreams, democracy and success. However the reality is , we like the tossing of the key to the valet (except the Hyatt at New Delhi which charges, pre-paid a Rs 100/- as valet parking charge), smelling the lobby air (unless it’s the Le Meredien which used to smell like French fries always (to a hungry salesman that’s good too), the smart walk to the pastry shop and chatting up the ladies at the counter.Some hotels put in four and half chairs for the coffee while your order for the cake, meat cheese is being packed. Last week R ohinesh, a friend I walk in the park with invited me to come over and let’s check out the new Oberoi Pastry shop. We often talk about little else other than food everyday. 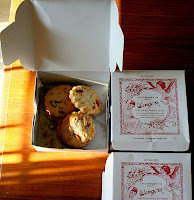 Actually I waited, and followed up for 6 months for the opening of the swanky new pastry shop at The Oberoi and then was reluctant to go as there was no discount after business hours. We the middle aged and middle class princes of the future decided to throw a care to the winds and decided to go check it out as an academic field tour. We throw the key (sorry I had my dear wife Praveen’s driver), walked in smelt that smell (did not smell of any food like substance) it was like forest in South of France kind of smell. My brother Sanjiv who worked for The Oberoi Hotel for 28 years and was the GM here from circa 1992 to 1996, often said the lobby should never smell of food. We walked past the Louis Vuitton, Bvlgari, Hermes and others to walk down to the old Kandahar (where prawns were the size of turkey legs in the 90s). Down the wide frosted glass stairs, into the 4000sq ft of intimidation. At The Taj, the staff chats up with y ou to make you comfortable. At The Oberoi, you chat up with the staff to make yourself comfortable. We scout around, the coffee counter, the meat section, the pastry section, the inviting picnic basket, the wines in a wine cooler. The décor was Spartan and nice. So was the stocking, the meat section was frugal; we expected it to be largely stocked. The wines were well stocked amongst other Chinkara ( a house brand as, its owned by the daughter of the Oberoi clan in Australia). We perch ourselves on high stools in the centre court around an enormous dummy cake, as the four and half coffee tables were occupied. The menus has small eats all, priced at Rs 600 and above, way out of our current league, so we settle for patties, nearly the cheapest things on display Rs 100 for a chicken patty and Rs 75 for a vegetable patty. We cannot escape not asking for tea or coffee as I have a feeling they might kick us out if we don’t and just stick to the patties. We order a cappuccino (Rs 245) for me and an orange pekoe (Rs 225) for my host. The people, we meet Atri Sengupta a friend of mine from my days at Star TV, with a friend. We see Azharuddin, the cricketer and now The MP from Moradabad with a friend (I hope I am right). Three br oad hipped women with a Quiche and a patty between them and narrow minded conversation around them. You should have seen the gift she gave……… (You know the kind). Great service for a pastry shop, no discounts yet and a cool place to hangout. The coffee is wonderful; I like coffee a shot as the one that burns the lip with the first sip. Hard to get it at any of the Café Coffeeday, Baristas and Costas. Have to be at a quality place to get that. Smarter to order tea as you get a pot, while coffee is only a cup. 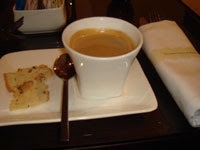 The biscuit with the coffee is divine, or is it called biscotti. A good experience. We spent Rs 645, for two beverages and two patties. Oberoi very smartly (started by the GM in 1992 and my brother Sanjiv Malhotra) has an inclusive price of taxes, service charge. Hence no surprises, you get a bill for the amount you expect. My wife often tells me that a common mans writing will not get me very far, hence I am taking baby steps through the pastry shop route. Next stop downtown dining and uptown dining and something in between.